Bicarbonate supplementation preserves renal function in experimental chronic kidney disease (CKD), but whether the same benefit occurs in humans is unknown. Here, we randomly assigned 134 adult patients with CKD (creatinine clearance [CrCl] 15 to 30 ml/min per 1.73 m2) and serum bicarbonate 16 to 20 mmol/L to either supplementation with oral sodium bicarbonate or standard care for 2 yr. The primary end points were rate of CrCl decline, the proportion of patients with rapid decline of CrCl (>3 ml/min per 1.73 m2/yr), and ESRD (CrCl <10 ml/min). Secondary end points were dietary protein intake, normalized protein nitrogen appearance, serum albumin, and mid-arm muscle circumference. Compared with the control group, decline in CrCl was slower with bicarbonate supplementation (5.93 versus 1.88 ml/min 1.73 m2; P < 0.0001). Patients supplemented with bicarbonate were significantly less likely to experience rapid progression (9 versus 45%; relative risk 0.15; 95% confidence interval 0.06 to 0.40; P < 0.0001). Similarly, fewer patients supplemented with bicarbonate developed ESRD (6.5 versus 33%; relative risk 0.13; 95% confidence interval 0.04 to 0.40; P < 0.001). Nutritional parameters improved significantly with bicarbonate supplementation, which was well tolerated. This study demonstrates that bicarbonate supplementation slows the rate of progression of renal failure to ESRD and improves nutritional status among patients with CKD. Evidence implicating MA in the progression of renal failure in patients with CKD is less convincing. Some experimental studies in rats have indicated that the MA of CKD is associated with the development and worsening of proteinuria and tubulointerstitial fibrosis and acceleration in the rate of decline in renal function13–16; however, other studies have failed to confirm this effect. Rats with CKD produced by the 5/6 nephrectomy model failed to demonstrate a beneficial effect of sodium bicarbonate supplementation.17 In rats that had CKD and were receiving a high-phosphate diet, MA actually prevented progression of renal failure, presumably as a result of inhibition of calcium phosphate deposition in the kidney.18,19 Few studies have examined the effects of amelioration of MA on renal function in humans. In short-term studies, administration of oral sodium bicarbonate to patients with moderate renal failure led to reduced protein catabolism, reduced ammonia production, and tubular damage, as assessed by biochemical parameters.20 Because of the short-term follow-up, no substantial impact on renal function could be demonstrated; however, in one cohort study,21 MA was independently associated with acceleration of renal failure in patients with CKD. The lack of long-term studies examining the impact of alleviation of MA on renal function in predialysis patients and on nutritional status was the particular stimulus to perform this study. We proposed the hypothesis that oral bicarbonate supplementation in patients with acidosis (plasma HCO3− levels >16 and <20 mmol/L) would be associated with attenuation of the rate of decline of creatinine clearance (CrCl) and a reduction in number of patients with rapid progression of renal failure defined arbitrarily as an annual fall in CrCl >3 ml/min per 1.73 m2. During a 1-yr period, 184 incident patients with CKD and low plasma HCO3− were seen. Fifty patients were excluded: 20 refused consent, and 30 were ineligible because of exclusion criteria (steroid therapy, n = 4; congestive heart failure, n = 7; uncontrolled hypertension, n = 11; cognitive impairment, n = 3; ongoing sepsis, n = 2; and morbid obesity, n = 3). A total of 134 patients were recruited. After recruitment and randomization, five patients from the treatment group withdrew before receiving any study drug because three were transferred to another affiliated renal unit and two were unwilling to perform the 24-h urine collections every 2 mo (Figure 1). Their 6-monthly data were included for an intention-to-treat analysis. Demographic characteristics were similar for both groups (Table 1). There were no significant differences in any baseline clinical or nutritional parameters between the two groups (Table 2). Participant enrollment and randomization to the study. Arm A (left column) allocated to oral bicarbonate and arm B (right colum) allocated to standard therapy. Oral sodium bicarbonate supplementation was given at a dosage of 1.82 ± 0.80 g/d, whereas the control group received standard treatment. 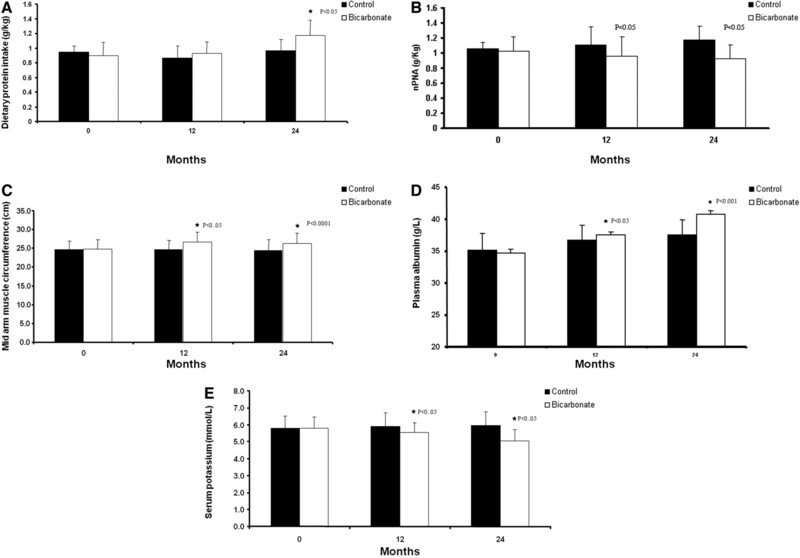 Serum HCO3− levels increased significantly in the treatment group compared with the control group and was maintained throughout the study period (P < 0.001; Figure 2A). This was achieved at the expense of an increased sodium intake, as shown by increased urinary sodium excretion in the treatment group compared with control patients (P < 0.05; Figure 2B). (A) Plasma HCO3− levels during the study period. Squares and bars denote means and SD. (B) Urinary sodium (Na) excretion per day. Squares and bars denote means and SD. (C) BP control during the study period. Squares and bars denote means and SD. (D) Urinary total protein excretion per day during the study period. Squares and bars denote means and SD. (E) Rate of decline of CrCl. Squares and bars denote means and SD. Despite increased sodium intake, BP control was similar between the groups (Figure 2C). The number of patients with BP of >130/80 mmHg was 14 and 10 at baseline, 15 and 16 at 12 mo, and 16 and 17 at the end of the study in the control and bicarbonate groups, respectively. Throughout the study period, the proportion of patients in both groups with BP of >130/80 mmHg was not statistically significant (P = 0.60). There was no difference in the number and types of antihypertensive medications at baseline and during the course of the study between the two groups. More importantly, loop diuretic use increased similarly by 30 and 39% in the control and bicarbonate groups, respectively (Table 3). Moreover, the use of angiotensin-converting enzyme inhibitors (ACEIs)/angiotensin receptor blockers (ARBs) increased similarly to 60 and 56% (P = 0.79) at 12 mo and to 66 and 60% (P = 0.69) at the end of the study in the control and bicarbonate groups, respectively. Urinary protein excretion was similar in the two groups throughout the study (Figure 2D). Rate of decline of CrCl was similar between the two groups up to 12 mo of follow-up because of dropout of 17 patients from the control group who had rapid decline and reached ESRD between 6 and 12 mo. Thereafter, the rate of loss of CrCl was significantly lower in the bicarbonate group compared with control subjects (P < 0.05; Figure 2E). The observed decline in CrCl during the study was 5.93 ml/min per 1.73 m2 (95% confidence interval [CI] 4.19 to 7.76 ml/min per 1.73 m2) in the control group compared with 1.88 ml/min per 1.73 m2 (95% CI −0.39 to 4.15 ml/min per 1.73 m2) in the treatment group. Nine and 45% of patients underwent rapid progression of their CKD (CrCl loss of >3 ml/min per 1.73 m2/yr) in the bicarbonate and control groups, respectively (relative risk [RR] 0.15; 95% CI 0.06 to 0.40; P < 0.0001). A significantly fewer number of patients developed ESRD that required dialysis (CrCl <10 ml/min) in the bicarbonate group (n = 4; 6.5%) compared with 22 patients in the control group (33%; RR 0.13; 95% CI 0.04 to 0.40; P < 0.001). Furthermore, Kaplan-Meier analyses revealed a significantly higher cumulative probability of starting dialysis in the control compared with the bicarbonate group (P < 0.001; Figure 3). Moreover, the study demonstrated that despite a larger number of patients who reached ESRD in the control group, the rate of decline in the remaining patients was still higher, suggesting that competing risks did not confound the results. Kaplan-Meier analysis to assess the probability of reaching ESRD for the two groups. Repeated ANOVA analysis with change in CrCl between start and end of study as the dependent variable and proportion of patients who reached ESRD showed that age, gender, and bicarbonate supplementation were significant predictors of slow rate of decline of CrCl and the development of ESRD. Detected decline in CrCl was 0.05 ml (95% CI 0.009 to 0.090; P = 0.02) for every year of age increment and 2.2 ml (95% CI 0.93 to 3.45; P = 0.02) for male versus female gender. ANOVA detected a difference of 4.05 ml/min per 1.73 m2 (95% CI 2.95 to 5.13; P < 0.0001) decline in renal function between the two groups after adjustment for age and gender. Surprisingly, proteinuria, BP, and serum calcium and phosphate levels were not associated with the primary end point, possibly because variation in these parameters was similar between the two groups. The nutritional indices are summarized in Table 2. Dietary protein intake (DPI), measured in g/kg per d, showed a significant increment in the bicarbonate group compared with the control group (P < 0.007; Figure 4A). Conversely, normalized protein nitrogen appearance (nPNA) decreased in the treatment group but increased in the control group (P < 0.002; Figure 4B). This increase in DPI and reduction in nPNA led to an increment in the lean body mass (LBM) as assessed by mid-arm muscle circumference (MAMC) in the treatment group from 24.8 (23.7 to 25.8) to 26.3 (25.0 to 27.5) compared with no change of 24.6 (23.5 to 25.7) to 24.5 (23.5 to 25.5) in the control group (P < 0.03; Figure 4C). There was an increase in calorie intake from 1499.0 ± 361.4 to 1796.0 ± 339.6 and 1568.0 ± 387.0 to 1640.0 ± 362.1 kcal in the bicarbonate and control groups, respectively, which was not statistically significant (P < 0.09). Serum albumin levels rose in the treatment group but remained unchanged in the control group. Albumin levels at the end of the study were significantly higher in the treatment group (Figure 4D). A significant decline was observed in serum potassium levels in the bicarbonate compared with the control group (P < 0.05; Figure 4E). Throughout the study period, serum C-reactive protein levels were similar between the two groups. Baseline serum calcium (2.24 ± 0.23 versus 2.33 ± 0.25; P = 0.24) and phosphate (1.42 ± 0.31 versus 1.48 ± 0.30; P = 0.26) levels were similar in the control and bicarbonate groups, respectively. During the study period, variations in the levels of calcium and phosphate were similar, and at the end of the follow-up period, there was no significant difference between control and bicarbonate groups in calcium (2.42 ± 0.23 versus 2.36 ± 0.16; P = 0.09) and phosphate levels (1.56 ± 0.43 versus 1.46 ± 0.33; P = 0.14), respectively. Similarly, the number of patients using calcium acetate as phosphate binder at baseline (18 versus 16%) and at the end of study (29 versus 25%) was similar between control and bicarbonate groups, respectively; however, hemoglobin levels increased significantly from 9.7 ± 2.0 to 11.7 ± 1.3 and from 10.5 ± 2.9 to 12.9 ± 1.9 in the control and bicarbonate groups, respectively (P = 0.001), with similar erythropoiesis-stimulating agent requirement. Repeated measure ANOVA, with MAMC as the dependent variable, showed that weight (P < 0.0001), gender (P < 0.0001), age (P < 0.0001), and bicarbonate supplementation (P < 0.001) were independently associated with change in LBM. The adverse events were similar in the two groups (Table 3). (A) Dietary protein intake on 4-d patient dietary records. Data are means and SD. (B) nPNA during the study period. Data are means and SD. (C) MAMC measurements during the study period. Data are means and SD. (D) Plasma albumin levels in the control and bicarbonate groups during the study period. Data are means and SD. (E) Serum potassium levels in the control and bicarbonate groups during the study period. Data are means and SD. The results of this study are also in complete agreement with our previously reported study.21 In this pilot observational study, we were able to demonstrate that during a 2-yr follow-up period, patients with stage 4 CKD and persistent uncorrected low bicarbonate levels between 16 and 21 mmol/L experienced an annual decline in their estimated GFR of >3 ml/min compared with 1 ml/min in those with bicarbonate levels >22 mmol/L. In this randomized study, bicarbonate supplementation was associated with slower rate of decline of CrCl similar to the level seen in nonacidotic patients with CKD in the observational study. Sodium bicarbonate supplementation in this study was also associated with better nutritional status, as demonstrated by improved dietary protein intake, and decreased protein catabolism in parallel with increased serum albumin and LBM. These findings are in part supported by several short-term, noncontrolled studies of patients with CKD.2–5 Some but not all studies have indicated that MA may be associated with PEW in patients who undergo dialysis.25–28 A large cohort study (n = 56,385) of maintenance hemodialysis patients showed a U-shaped association with increased mortality at both ends of the serum HCO3− spectrum (<17 and >27 mmol/L).29 After adjustment for potential markers of PEW, this association transformed into a reversed J-shaped relationship with a HCO3− level ≥22 mmol/L, associated with less risk for death, whereas values <22 mmol/L were associated with the highest death risk. On the contrary, in a separate cohort of maintenance hemodialysis patients from the Dialysis Outcomes and Practice Patterns Study, unadjusted moderate predialysis acidosis was associated with better nutrition, survival advantage, and reduced hospitalization rate.28 The importance of an optimum acid-base status for positive clinical outcomes and survival has been acknowledged by Kidney Disease Outcomes Quality Initiatives (K/DOQI)30 and the European Renal Nutrition31 consensus that recommend maintaining an HCO3− level of >22 mmol/L. In a comprehensive Cochrane Database of Systematic Reviews published recently, authors were able to find only three randomized, controlled trials (RCTs) of adult dialysis patients (n = 117).32 There were insufficient data for most outcomes to perform a meta-analysis. In all three trials, correction of acidosis was achieved variably but was associated with significant improvement in nutritional parameters apart from heterogeneity in serum albumin response. The studies were underpowered to assess clinical outcomes. The conclusion of that report stated that data on benefits and risks of correcting MA is very limited with no RCTs of pre-ESRD patients and only three small RCTs of dialysis patients. In this regard, our study has taken a significant step in filling the vacuum in the literature as a result of complete lack of RCTs in pre-ESRD patients with MA. The positive nutritional benefits seen in the study of sodium bicarbonate supplementation are of clinical significance. An optimum nutritional status has positive implications on the clinical outcomes of dialysis patients, whereas PEW is associated with increased morbidity and mortality. Low serum albumin in dialysis patients is associated with increased mortality,33 with values <35 g/L linked to poor outcomes.34 PEW affects approximately 40% of patients at the initiation of dialysis35 and is linked to increased morbidity and mortality during maintenance dialysis.36 Although pathogenesis of PEW in uremia is multifactorial, low nutrient intake, reduced protein synthesis, and increased protein catabolism play the dominant role. DPI is reduced in parallel with decline in renal function. It improved after bicarbonate supplementation, which is in keeping with the suggestion that bicarbonate supplementation has a positive effect on appetite.37 Moreover, LBM as determined by MAMC values (normal values +25.3 cm in men and +23.2 cm in women) increased from 24.8 to 26.3 cm; this 2-cm increment is clinically significant because it lifts the patients to the 50th centile of the nutritional status chart. The significant increase in the serum albumin was evident only later in the study in contrast to the earlier and consistent improvement in LBM. The decrease in nPNA reflecting a lower protein breakdown is in agreement with other studies in which bicarbonate supplementation was associated with reduction of protein degradation in both peritoneal7,8 and hemodialysis9,10 patients as well as in elderly pre-ESRD patients.3 The increase in muscle mass seen without significant increase in calorie intake can be partly explained by protein anabolism. Nutritional data should be interpreted with some caution because the techniques used in the assessment of PEW syndrome, even though commonly practiced, are to some extent subjective and insensitive. This study has several strengths. The sample size of 134 patients is substantial for a single-center study and is the first report of its kind in this area of research. Duration of follow-up was sufficiently long to observe clinically meaningful outcomes. Moreover, the study was conducted from a busy predialysis clinic and was close to a real-life setting. The patients were heterogeneous with respect to underlying disease, race and ethnic group, and duration of disease, making it likely that the findings can be translated to other populations with CKD. Clearly, it cannot apply to those with associated morbid obesity, cognitive impairment, chronic sepsis, overt congestive heart failure, and uncontrolled hypertension because these comorbidities were the exclusion criteria for this study. Nutritional parameters were assessed blindly by a single dietitian, and, as expected from a single-center study, data collection was complete. Compliance in the study was satisfactory as evident by consistent elevation of bicarbonate levels and urinary sodium excretion, and the end points were rigorous and clinically meaningful; however, this study can be criticized for a lack of placebo use and absence of a double-blind design. Like any other single-center study, reproducibility and generalizability of this report will require further validation by a double-blind, placebo-controlled, multicenter trial. In conclusion, oral sodium bicarbonate supplementation in patients with low plasma HCO3− levels slows the rate of decline of renal function and the development of ESRD in patients with advanced stages of CKD. This cheap and simple strategy, which is in line with current renal consensus documents, also improves the nutritional status of patients and has the potential of translating into significant economic, quality-of-life, and clinical outcome benefits. We conducted a single-center, open-label, randomized, prospective, parallel-group study from July 2003 through March 2006 including recruitment period, with a 2-yr follow-up period. Participants were the incident patients who had CrCl (calculated from 24-h urine sample) of 30 to 15 ml/min per 1.73 m2 and attended the low-clearance (LC) clinic at the Royal London Hospital, part of the Barts and The London NHS Trust, serving the East End of London United Kingdom community. The study compared the effects of oral sodium bicarbonate supplementation on the progression of CKD and nutritional status in predialysis patients. The eligibility criteria for this study were as follows: (1) Age >18 yr, (2) stages 4 and 5 CKD, (3) plasma HCO3− <20 and >16 mmol/L on two consecutive measurements, and (4) stable clinical condition. We excluded patients with malignant disease, morbid obesity, cognitive impairment, chronic sepsis, and poorly controlled BP (>150/90 mmHg) despite use of four agents, and overt congestive heart failure. Patients were randomly assigned to receive either oral sodium bicarbonate tablets 600 mg thrice daily increased as necessary to achieve and maintain HCO3− level ≥23 mmol/L in the treatment group or routine standard care. Serum HCO3− was measured every 2 mo, and dosage of sodium bicarbonate tablets was adjusted as necessary at the clinic by the chief investigator to maintain levels ≥23 mmol/L in the treatment group. Apart from the study drug, patients from both groups received identical standard treatment and monitoring for their CKD. To avoid increased acid load, use of sevelamer hydrochloride was avoided; to avoid an interaction between calcium carbonate and sodium bicarbonate, calcium acetate was the only phosphate binder allowed in this study. Enrolled patients were stratified by gender and presence or absence of diabetes. Stratified treatment allocation on the basis of block randomization within each stratum (men, women, patients with and without diabetes) was used and carried out by a statistician who was not participating in the trial to ensure sequence concealment, until bicarbonates were assigned to all participants. The principal investigator (I.d.B.-A.) recruited patients and was blind to group allocations until the end of the study. The primary outcomes were decline in renal function by assessing changes in CrCl (calculated on 24-h urine sample) from baseline to the end of the study period; number of patients with rapid progression of renal failure arbitrarily defined as a fall in CrCl of >3 ml/min per yr; and development of ESRD that required dialysis, defined as CrCl <10 ml/min, between the two groups. All patients with CrCl <10 ml/min commenced dialysis as part of renal unit protocol. All such patients' electronic record (including those who participated in this study) was reviewed independently in a separate weekly multidisciplinary meeting, attended by all six renal physicians, four senior dialysis nurses, and a social worker, in which the exact timing of initiation dialysis was determined within 2 wk. All patients who develop uremic symptoms and or fluid overload and or hyperkalemia (potassium levels >6.0 mmol/L) are also discussed in this multidisciplinary meeting. Invariably, these patients are treated medically in the first instance by more intense monitoring from clinicians, dieticians, and senior predialysis nurses at weekly intervals. Only on very rare occasions have patients with CrCl >10 ml/min initiated dialysis in our unit, and none of the patients who participated in this study started dialysis with CrCl of >10 ml/min. The secondary outcomes were measurement of changes in nPNA and overall nutritional status. Blinded assessment of outcomes and statistical analysis was carried out by another statistician (M.V. ), in complete ignorance of the assigned groups. The study was conducted according to the Declaration of Helsinki and approved by the local research ethics committee (ethics no. P/01/211), and written informed consent was obtained from each of the study participants. Nutritional status was assessed by MAC, nPNA, serum albumin level, anthropometric MAMC as a marker of LBM, and DPI. MAC and TSF were measured in the nondominant arm relaxed at the side with the hand resting on the thigh.41 Anthropometric measurements were carried out by a single observer, one of the researchers—an experienced renal dietitian—to minimize interobserver variation.42 They included TSF and MAC, whereas LBM was calculated from MAMC. MAMC was derived from the Bishop43 formula using MAC and TSF: MAMC (cm) = MAC (cm) − TSF (mm) × 0.314. These assessments were performed at 0, 6, 12, 18, and 24 mo by the same observer blinded to the treatment group allocation. Protein nitrogen appearance was calculated by the Bergstrom equation,44,45 which takes into account urinary protein losses; it was divided by actual body weight (ABW) for normalization (nPNA): nPNA (g/kg per d) = [13 + 0.204 urea appearance (mmol/d) + protein loss (g/d)]/ABW. An estimate of the habitual dietary intake of each patient was made from a 4-d food diary. This was completed before visiting the research dietitian at each follow-up appointment. Patients were asked to record all food and beverages consumed and instructed how to note quantities of foods and drinks taken, portion sizes, different brand names, and plate waste. The importance of adherence to their normal diet was emphasized. During their appointment with the research dietitian, accuracy of the diaries was checked. Data from the diaries for calorie and protein intake were analyzed using a nutrition database program (CompEat 5.0; Carlson-Bengsten Consultants Ltd., Grantham, Lincs, UK). This database software program contains a comprehensive range of foods and beverages including fortified and different food brands such as breakfast cereals, fruit drinks, cakes, and other nutritional items available in the United Kingdom. The sample size was estimated by power analysis performed by SYSTAT Windows Statistics software (SSI, San Jose, CA) with CrCl as the primary outcome measure. In a previous pilot longitudinal observational study21 with a follow-up period of 2 yr, it was demonstrated that 50% of the patients with untreated acidosis developed a decline of CrCl >3 ml/min per yr, which was arbitrarily chosen as a maker of rapid progression. Sample size calculation showed that 63 patients in each group would give a 90% power with a significance level (α) of 0.05 to detect an absolute difference between the two groups of 30% in the number of patients with a CrCl decline >3 ml/min per yr, as demonstrated in a pilot study.21 To allow for possible poor compliance, we added an extra 10% of study recruits, making 67 per group, a total 134 patients. Although it is unusual to power a study at 90%, it was thought that it may strengthen the results in view of absence of any control prospective data in this area. All statistical analysis was performed by SPSS for Windows software (SPSS, Chicago, IL). Continuous variables were compared by ANOVA, and categorical variables were compared by χ2 analysis. The probability of reaching ESRD was assessed by the Kaplan-Meier analysis. For the repeated measures ANOVA, the two groups (with and without bicarbonate supplementation) were introduced as a categorical variable. ANOVA model with no interaction term, just main effects specified by the aim of the project, was used and is considered to be sufficient in analyzing data from RCTs. The potential confounding variables, such as age, gender, race, cause of renal disease, proteinuria, BP control, and serum calcium and phosphate, were entered in the univariate model, and variables that were significant in this model (P < 0.05) were added to a multivariate model. Repeated measure ANOVA was then used to analyze the effect of sodium bicarbonate supplementation on longitudinal changes on CrCl and nutritional indices. Binary data for rapid progressors and ESRD were used to calculate relative risk, and P values for such data were derived with the use of χ2 test. Multiple comparisons were controlled for using the Bonferroni correction with corrected P < 0.05 considered statistically significant. One hundred percent data were available for time points 0, 6, and 24 mo on all study patients. 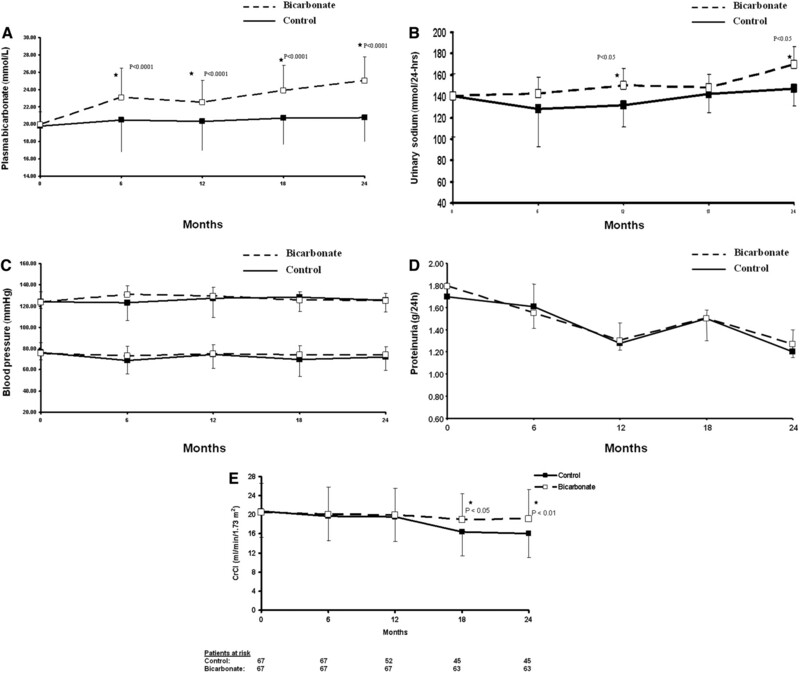 At time points of 12 mo (eight and three patients) and 18 mo (seven and two patients) from bicarbonate and control groups, respectively, did not attend the clinic (P = 0.17); however, these patients were given an earlier appointment (within 2 wk) and data collected on subsequent clinic visits were used for statistical analysis as their 12- and 18-mo data. This way we had no missing data for statistical analysis. In the control group, 17 patients reached ESRD between 6 and 12 mo. Two of these 17 patients reached ESRD within 2 wk of the 12-mo time point, and their last CrCl was entered for the 12-mo analysis. Five patients reached ESRD between 12 and 18 mo. In the bicarbonate group, only four patients developed ESRD between 12 and 18 mo. Data of patients who reached ESRD during the study in each group were omitted from subsequent analysis for rate of decline of CrCl, but data for secondary nutritional end points was collected longitudinally until the end of the study in all patients. Results are expressed as means and 95% CIs for main primary (CrCl) and secondary (MAMC) end points and as means ± SD for remaining variables in both the text and figures except where it is specified otherwise. M.M.Y., chief investigator, designed and wrote the research protocol for this study. I.d.B.-A., principal investigator, carried out the study, monitored nutritional status progress, and collected data. M.M.Y. and I.d.B.-A. had full access to all of the data in the study, and both take responsibility for the integrity of the data and the accuracy of the data analysis. I.d.B.-A. also drafted the manuscript that was revised and edited by all authors. M.V. carried out the statistical analysis but had no other part in the study and was blind to research questions and group allocation. We thank all of the patients for participating in this study. We also thank Barts and The London Charitable Foundation for financial support. These organizations had no other part in the design, conduct, collection, management, analysis, and interpretation of the data. There was also no involvement in the preparation, review, or approval of the manuscript. This study is registered on the International Standard Randomized Controlled Trial Number Registry (ISRCTN-17109689). See related editorial, “Metabolic Acidosis and Progression of Chronic Kidney Disease,” on pages 1869–1870.